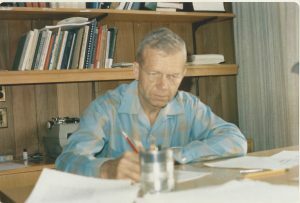 On May 31, 1964 he was honored by his alma mater, Washburn University in Topeka Kansas, with an honorary doctor of literature degree. 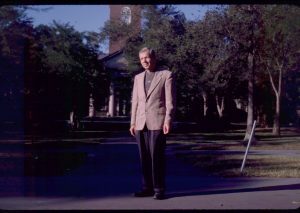 Part of the time Dwight was formally associated with Harvard, 1969-1970, was actually spent as a Fellow at the Center for Advanced Study in the Behavioral Sciences at Palo Alto, California. 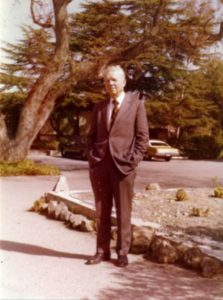 Dwight at the Center for Advanced Study in the Behavioral Sciences, Palo Alto, 1969-70. Dwight, briefcase in hand, prepares to head off to CASBS. 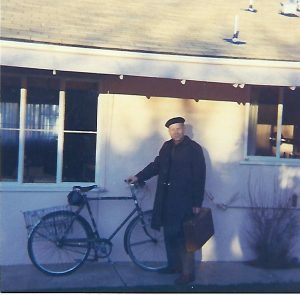 He and Louise lived at 3486 Bryant St., Palo Alto. This photo probably was taken about December 1969. Note the rear bike baskets, good for carrying his briefcase and groceries. The time Dwight spent at the Center must have been a welcome change. He could enjoy conversations with his colleagues and not have to worry about teaching or administrative duties. He could concentrate on thinking, reading, and writing. And nearby were the facilities of Stanford University Library. Sadly, in April 1970, during the time Dwight was at the Center, it was the target of a fire-bombing which destroyed one scholar’s life work, completely destroyed ten offices, and left most of the others damaged by smoke and water. Dwight was fortunate that he had most of his records at home. 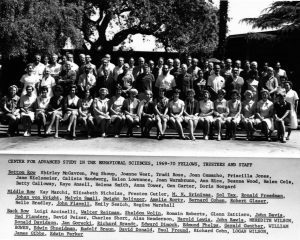 Center for Advanced Study in the Behavioral Sciences, 1969-1970 Fellows, Trustees, and Staff. Photo courtesy of CASBS. Dwight is in the second row a little to the right of center. Dwight and Louise rented a home in Palo Alto while he was a part of CASBS. That year probably made them realize that Palo Alto was where they would live after Dwight retired. Dwight at his desk, probably at home in Belmont. 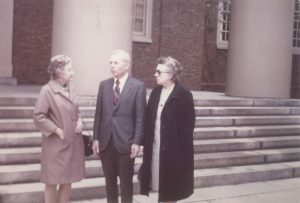 Dwight and Louise (in a dark coat) with friend in front of one of the university buildings. 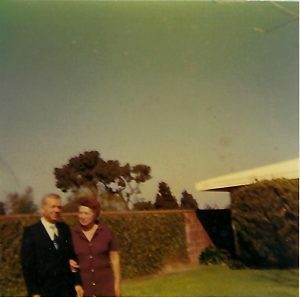 Dwight and Louise in 1971, possibly on a visit to Palo Alto. 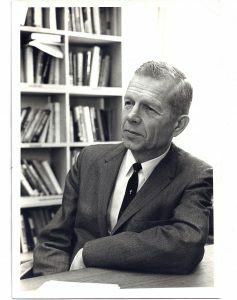 It was in 1972, one year before his retirement, when Dwight was elected president of the Linguistic Society of America.